Asia Shore Excursions offers the best Hue shore excursions for cruise ship passengers stopping at Chan May Port to visit Hue city, taking a boat trip on the Perfume river or visiting Hue’s ancient monuments. Please contact us for the best Hue day tours from cruise ship. Hue, the former capital of Vietnam from 1802 to 1945, is famous for its monuments such as the royal palaces and pagodas, and the emperors’ tombs and temples. 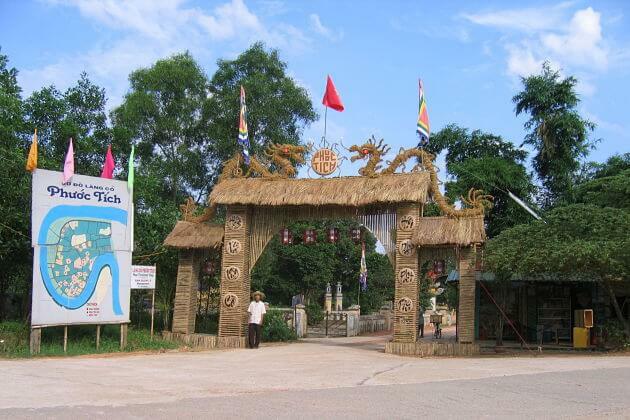 Hue shore excursions are also well-known for visiting a cultural site and the best Vietnamese cuisine. 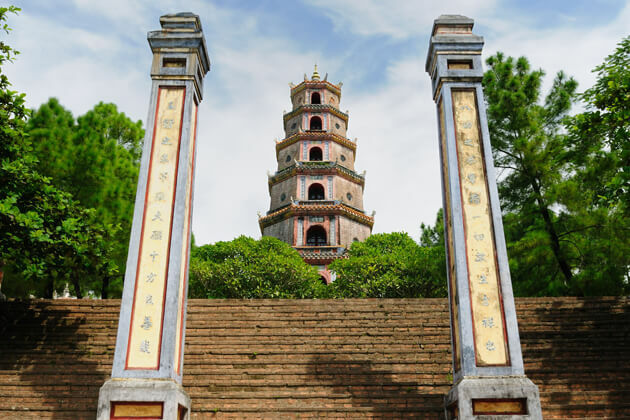 Although the city was heavily damaged during the American War, day tours to Hue promise a wonderful time get a glimpse of exploring an idyllic city inspired by old-fashioned Vietnam. Hue was among the first place in Vietnam listed as a UNESCO World Heritage site since 1993, this deeply evocative capital of the Nguyen emperors still resonates with the glories of imperial Vietnam, even though many of its finest buildings were destroyed during the war. Restoration work is going on to recover Hue’s lost royal monuments. 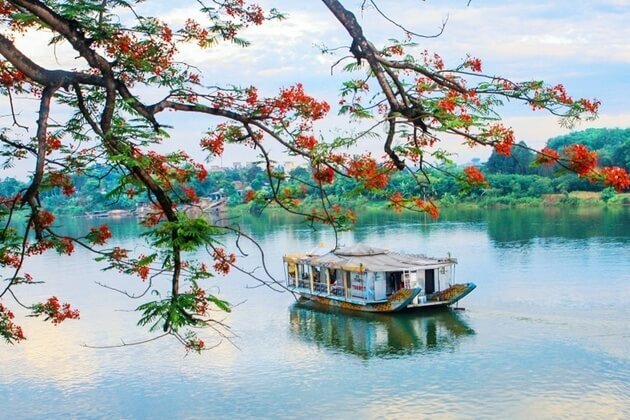 Located on the river bank of the picturesque Perfume River, Hue owes its charming scenery to the great combination of river, natural landscape and the splendor of historical monuments. Nowadays, Hue day tours still hide a blend of new, traditional and modern. Coming in to Chan May Port, on Jan 13th Friday. What does the Old Citaldel tour cost for two people, and is it available. Thank you for your request. Please check your email for detailed quotation of Hue shore excursion. Feel free to contact us should you have other enquiries. We have a group of 6 arriving in Chan May port on 3/8/18. Please let me know what would be the cost per person for the “Explore the Old Citadel” tour. Thank you for contacting us. The detailed quotation for Hue shore excursion has been sent to your email. Please have a look at it and let us know if you have any other enquiries. Thanks for reaching to us. Please check your email for the detailed quotation on this Hue shore excursion. If you still have any other question, please contact us. I arrive in Chan May Port on Saturday the 6th July 2019. I am interested in the Hue day tour which includes the Citadel. Can you let me have more information, costs etc. We have a plenty of ready-made itineraries for shore excursions in many ports of Asia that you can have a look on the website. For easier, check your email for the suggested itineraries and other information. 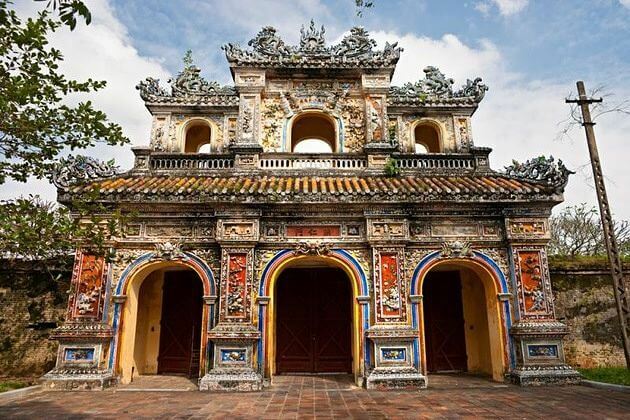 Being the former capital city of Vietnam for approximately 150 years, Hue is one of the most must-visit destinations in Vietnam shore excursions. Only by traveling to Hue day tours by yourself that tourists can experience the traditional and cultural atmosphere of this city. Since then you can understand why thinking about the Ao Dai and Non La – the symbol of Vietnam in general, people always evoke of Hue. Hue day trips are famous for its historic monuments some of which are recognized as UNESCO’s World Heritage Sites. The city maintains a variety of French-style buildings lie along the Perfume River one of which is the oldest high school in Vietnam – Quoc Hoc high school. The religious city where Buddhism has stronger support than elsewhere in Vietnam. The city whose cuisine forms the heart of Central Vietnamese cuisine with a significant type of noodles made from its name – Bun Bo Hue. The more you explore Hue, the fewer things you understand about it! It is so difficult to actually understand this city thoroughly! One small thing you should know in your shore excursions is that the easiest way to Hue shore excursions is from Chan May port – which also a significant attraction of Hue that tourists can add it to their itinerary also. By the way, a list of things to do and see in Hue day trips will be detail specified below as the suggestions for tourists to save times on their Hue shore excursions. The very first place that every tourist go immediately when they come to Hue day tours is the Imperial Citadel and Forbidden city. Why? It is the most important headquarters of Vietnamese in the Nguyen Dynasty as well as the World Heritage recognized by UNESCO. The Citadel City used to be the place where the old Emperors lived with an extremely strict arrangement of the army inside to protect the royal family that only very important people could enter here. Therefore, the architectural structure of this place is such representatives for the powerful Nguyen Dynasty that ruled Vietnam in the past. Fortunately, hundreds of them still maintain until now that cruisers need to spend at least a few hours to explore all of this 500ha destination. From the Merdian Gate – the iconic symbol of the Citadel City and the feudal dynasty, the Thai Hoa Palace and Dai Trieu Nghi Yard – a powerful center of the Vietnamese feudal dynasties in the past to the Hien Lam Pavilion – the highest structure in this imperial city and so on. You will totally immerse yourself in this ancient place and become a part of it. 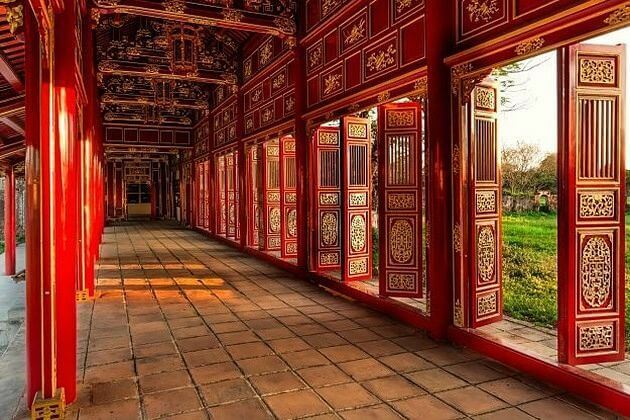 Exploring all spots in Hue Imperial and Forbidden city will definitely take times, tourists should spend the all day from early in the morning for this destination only in your list things-to-do in the Hue day trips! 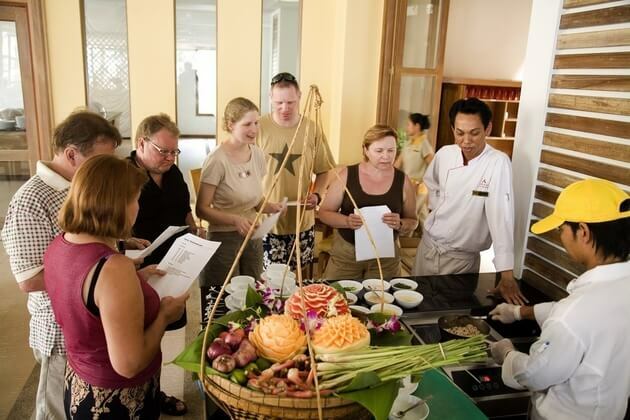 Hue cooking class is such the hidden gems of the Hue day tours that it is such a brand new and interesting experience for foreign tourists. They will be guided step by step by local people how to cook Hue cuisines from the most typical one – Bun Bo Hue to various daily dishes. Besides, tourists can understand clearly how it is said that the royal lifestyles and customs still maintain its impact on the characteristics of Hue people by trying their daily routines yourself. 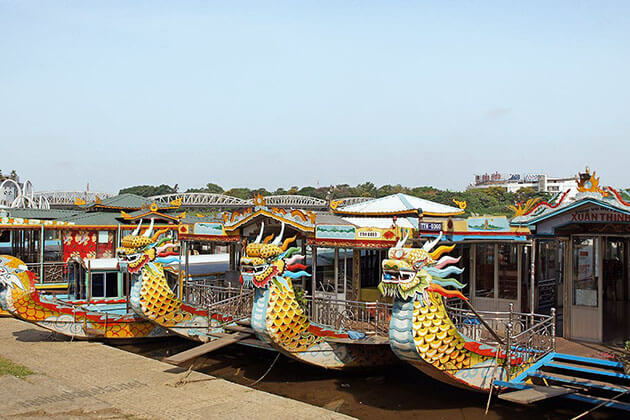 In Hue shore excursions from Chan May port, tourists can choose between the Hue countryside day tours or on the King Dragon boat for their cooking class. Of course, the Hue shore excursions will travel on a luxury cruise ship from Chan May port which will give you such a great opportunity to enjoy the Chan May shore excursions also! It is said that the best and the easiest way for foreigners to understand thoroughly the local lifestyles is going to markets. 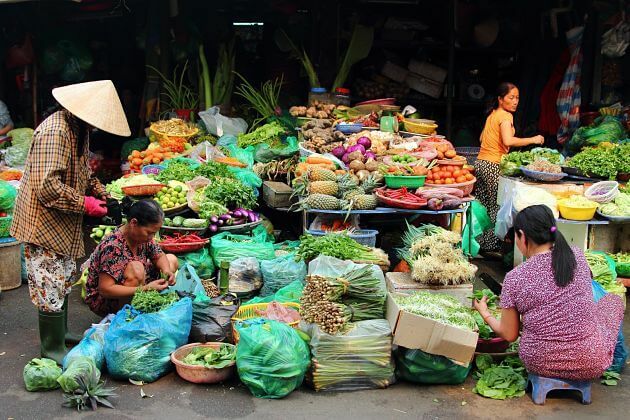 That is the reason why you should not miss the oldest and the most well-known markets in your Hue shore excursions – Dong Ba market! Tourists cannot deny that the local people are definitely early birds when they open the market at 3 am to let the citizens here can come as early as possible to purchase the freshest seafood, fruit, and vegetables. With a variety of products, the Dong Ba market has everything you can think of from clothing, blankets to handicrafts, souvenirs. Do not forget going to the ground floor where the food court is located. This food court even better than street food! It not only has a wide range of cheap and delicious food for you to fill in your stomach but also is a cozy bustling restaurant that you don’t need to afraid of the weather - in spite of hot or cold temperature, sunny or rainy day. 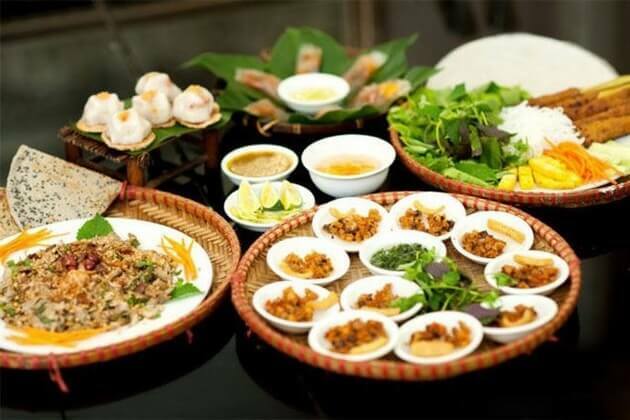 Nothing can stop you from enjoying the most authentic Vietnamese dishes in general such as pho, banh mi and Hue cuisine in particular like Bun Bo Hue, Com Hen (Tiny mussel rice) or Banh Beo (Bloating Duckweed-shaped cake). It is not really comfortable for the visitors who have long legs because of plastic tables and chairs. But no doubt that it is definitely your brand new experience in Hue day trips! Hue and Perfume River are such lovely couples that they always have close relations with each other. Perfume River or Huong river has been always a part of the daily life of Hue people for centuries. From this spectacular river, their life flourishes from normal activities such as exchange products, build houses to show their respect to their own religion by building various pagodas and temples along this river. You just need to relax in the flow of the river, let the river herself help you to continue your Hue shore excursions. Getting started at Chan May port, the Perfume River will slowly let you know another sight of Hue as well as introduce you to all her children – various monuments to tell you the story of its origin such as Thien Mu pagoda, Royal Tomb of Emperor Tu Duc and so on. You will definitely fall in love with the Perfume River – your storyteller as well as her magnificent children! 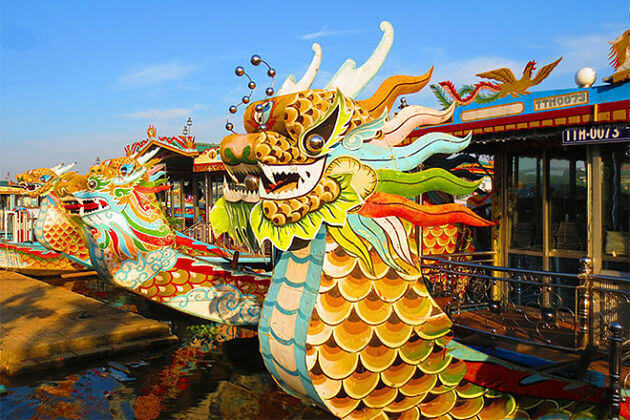 Being a World Heritage city, Hue day tours introduce a variety of traditional festivals take place throughout the year. Some of the biggest festivals can be mentioned such as Hon Chen Temple Festival which occurs twice a year in the third and in the seventh of the Lunar month to honor the Holy Mother Thien Y A Na; Thai Duong Ha festival of praying for fish is held on the 12th of the first month in the lunar calendar to honor the merits of the village spirit or Sinh village’s wrestling festival is organized on the 10th of the first month in the lunar calendar to honor the sporting spirit the Hue people during the centuries and so on. The festival is expected most and is highly recommended is the Hue Festival which is held every two years normally from April 27th to May 2nd. The main purpose of this festival is to honor the cultural and historical values of that Vietnam’s former capital city. 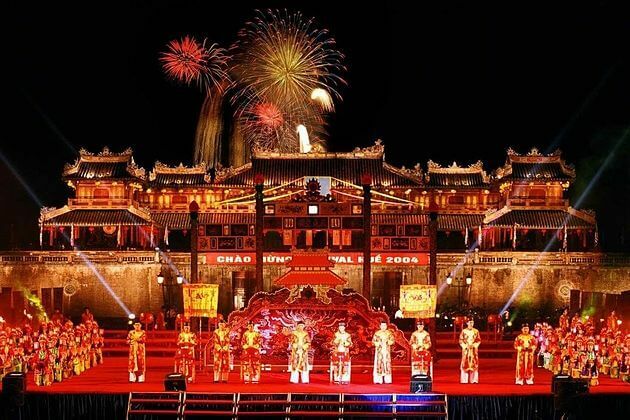 This is such a great opportunity for cruisers to experience the unique heritage of Vietnamese royal art – royal dancing which still be well preserved until now as well as Hue’s famous traditional singing such as Hue singing – the distinctive art performance of Thua Thien Hue or Hat boi Hue – a kind of classical theater from Hue. Besides, there is also a wide range of performance from 19 different countries. Each festival will occur at different times, different regions with different meanings. You can tailor-make your own Hue shore excursions from Chan May port to participate in the festivals that you’re interested in. Hue, geographically located in the central of Vietnam, is one of the oldest cities and used to be the capital of Vietnam in past time. Hue is notable to many people as Vietnamese traditional culture and also historical heritages. Additionally, tourists will revel in many unique traditional performances and cuisine in Hue as well. Due to the location in the Central of Vietnam, the weather in Hue is pretty hot with high humidity in some months, which makes both domestic and foreign visitors feel uncomfortable and sweaty. Understanding your need, Asia shore excursions desire to support you a fancy Hue shore excursion, that is why we mention the best time to visit Hue bellow. The climate in coasts and delta area of Hue is typically tropical and divided into two distinguished seasons that are the dry season (from March to August) and the rainy season (from August to January). While the temperature in the dry season reaches a maximum level of 40 C, in the rainy season Hue weather becomes to get colder, the temperature can go down to 19,70 C. Especially in higher areas like highlands or mountains, Hue weather is generally cooler. If you are planning a Hue tour, any days in the dry season would be the best time to visit Hue, and the rainy season isn’t recommended. In Hue, February to April time are spring season when the weather in Hue is so perfect that it can occur all activities. The average temperature is about 22°C, which makes Hue shore excursion much pleasant to go outside and delve into the poetic city. The volume of rain in Hue in these two months is at its least, thus tourists will not be nervous that rain will ruin their sabbatical time. 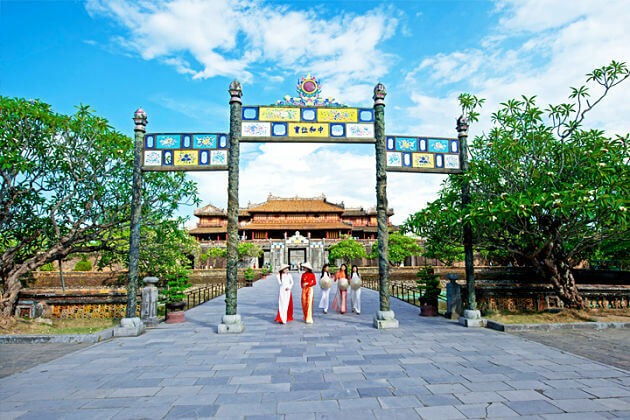 In these months, the weather in Hue is so perfect for tourists to visit myriad of historical sites such as Imperial City, Thien Mu Pagoda, Minh Mang tomb, and relish traditional performances as Hue’s royal court music. Moreover, besides these ideal months, January and May are also recommended to be a guest of Hue, but in these two months, it is rainy more than other ones. Though the rains come more often, the temperature and humidity are still very enjoyable for tourists. This time is still feasible to call on Hue, but it isn’t highly suggested since Hue weather now is moderate. In detail, these months are the summer time of the year, the weather in Hue is the hottest with the average temperature of 30 degrees, making it much more annoying for travelers. Nonetheless, in this type of Hue weather, tourists will delve into the deep blue sky in exchange for the hot weather. Tourists can visit Hue in this season, but not highly supported. In the first place, Hue is relatively cramped in August since this is the high season for domestic travel. Secondly, it’s also the rainy season from September to December, thus, the rains come frequently and will last a few hours. As the result, your Hue shore excursion might be demolished in these months.